Kitchen area is open for every guest to use and is fully equipped. 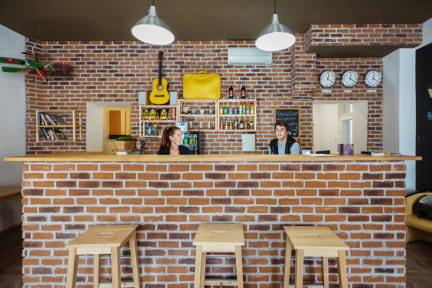 Our receptionists at Hostel Brickyard will give you best suggestions where to have fun, eat cheap and tasty and enjoy the sightseeing. Our backyard will give you best opportunity to relax and get the energy for exploring Bratislava. Guests can use our computers in the reception area or use WiFi throughout the whole hostel. Our hostel has no curfew. 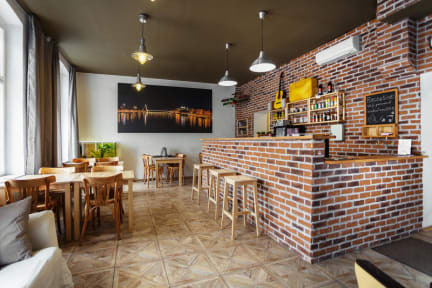 We are located in the city center of Bratislava, very close to the main train station (Hlavna stanica) and just short bus ride from the bus station. All the transportation hubs are very near and also the historic center is a short walk away. In the nearby area there are several bars and restaurants and cafes. Grocery store is about 2 mins walk. Our hostel has several types of rooms including twin, double, 3-bed private rooms and 4,6 and 8 bed dorms. All our spacious rooms are ensuite with big bathrooms. Our services include free bed linen and towels on request, washer and dryer, free maps and info about the town, and free luggage and bike storage after check-out and before check-in. Taxes not included - city tax 1.70 EUR per person per night. Students under 26 with valid student ID, youth under 18, disabled and elderly over 70 are excluded from the liability. Very clean hostel. Staff is really friendly and available 24h. Location for me was perfect since i needed to get catch a bus to the airport from Hl. Station early in the morning. For people visiting Bratislava, it may be a bit off the city centre. Overall very good experience and highly recommendable. I really liked this hostel and the location was great for me. Loved large room, wooden windows and spacious bathroom. I loved this hostel, but it’s not great if you want a hostel with a lot of atmosphere. I actually had the whole room to myself because there was no one else there. However, I was not there at a typical touristy time, so it may be different sometimes. Good place to stay for 1-2 nights, not far from the city centre and very convenient to reach from the airport (direct bus 61). Welcoming staff, hygiene was ok (everything was clean). Points to improve: - install true shutters on the windows : sleeping with a flashing screen ad in front of the hostel was difficult... - WC/bathroom light : even if the movement detector is well-intentionned to iluminate those rooms in the dark, it also lights the sleeping room... So be aware, wear sleeping masks! Greatest location -3 min walk from train station, which mean so also 3 min walk from bus to airport. And 10 min walk to historical center . Friendly stuff. Everything is bit old (matrasses, kitchen) but clean. Kettle, microwave and plates, cups are at the kitchen. Recommend. This hostel was absolutely fine for my 2 night stay. Relatively clean and tidy. Bedding very cheap and thin but that’s what you’d expect! Unfortunately a lack of atmosphere let’s this hostel down. The common area is surprisingly small and there was no activity. There’s nothing wrong with this at all but it’s not what I was looking for - the hostel seems to want to be more of a travelers hostel when it is really somewhere for locals to stay cheaply when they need a bed in the city. Rude staff, and terrible facilities. I had an awful stay and would never visit again even if it was free.